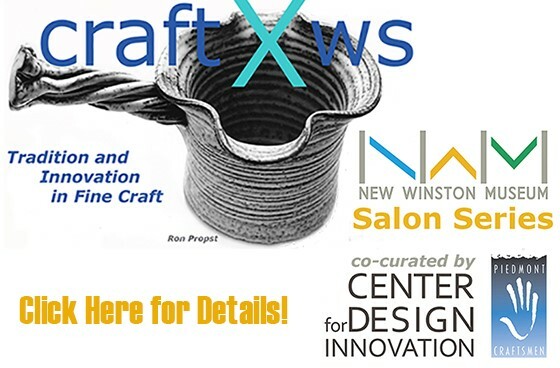 Piedmont Craftsmen is excited to announce it is partnering with the Center for Design Innovation to co-curate New Winston Museum’s spring quarter Salon Series titled craftXws: Tradition and Innovation in Fine Craft. The three event series will focus on the crafts movement in Winston-Salem, past, present and future. Discussions will explore the varied historical and contemporary dimensions of the area’s craft practice, beginning with the Moravian settlement, through the diverse contributions of the 19th and mid-20th century craft revivalism, to the evolving frontier of fine craft in our current tech-steeped arts and innovation landscape. What explains this region’s particularly deep affinity for collecting fine craft, the strong institutions dedicated to craft education, and the enduring practice of making by hand? Artists, collectors and historians will be featured in each of three New Winston Museum Salon Series: craftXws presentations. The first in the series, The Craft Tradition in Winston-Salem, will be held on Thursday, April 27th from 5:30 till 7PM. The Salon Series will be held at the Center for Design and Innovation at 450 Design Ave (near Salem College). These educational events are free and open to the public. Johanna Brown, MESDA, Curator of Moravian Decorative Arts and Director of Collections. Cheryl Harry, Director of African American programing at Old Salem Museums & Gardens. Founder, Triad Cultural Arts and author of, Winston-Salem’s African American Legacy. Tomi Melson, fiber artist and exhibiting member of Piedmont Craftsmen since 1973. Former Assistant Director of the Sawtooth School and former Executive Director of Piedmont Craftsmen. teacher, and exhibiting member of Piedmont Craftsmen since 1968. The second presentation in the New Winston Museum's Salon Series is Craft, Technology, Innovation on Thursday, May 18th. The third in the series is Objects and Memories on Thursday, June 15th. Presenters and moderators will be announced by the end of April for the second and third presentations.